Home Desert Caesars Entertainment Announces Scottsdale as Location for First Non-Gaming Hotel in the U.S. It may not have slot machines, but the new Caesars Republic Scottsdale will boast a jackpot-worthy location and Scottsdale’s only rooftop pool. Casesars Entertainment Corporation (the team behind Caesars Palace in Vegas) announced plans to open Caesars Republic in Scottsdale. 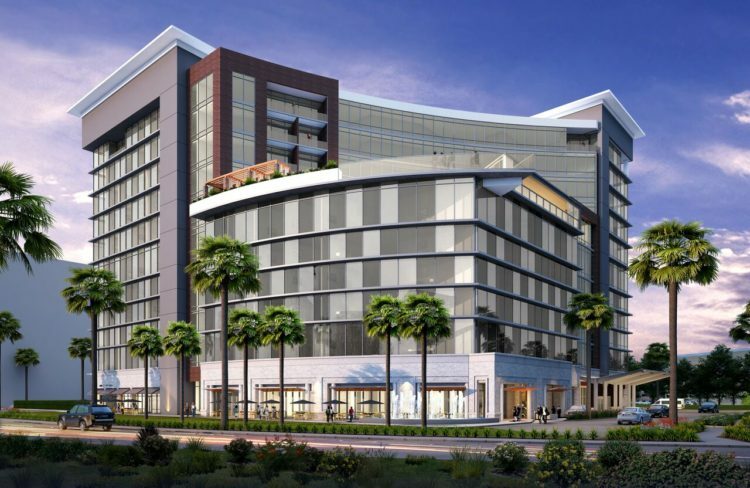 The non-gaming hotel will be the brand’s first in the U.S. and will be located at North Goldwater and East Highland Avenue, adjacent to Scottsdale Fashion Square. The new four-star hotel is part of the brand’s plan to expand its loyalty network and is set to break ground in the second half of 2019. The glass-structure hotel will feature 11 stories with 266 rooms. Like one would expect from a luxe brand, the interiors will be decked out with rich textures and strong architecture, contrasted by soft curves and a bold and classy lobby. There will be a first-floor bar and a signature restaurant, both ideal for travelers and locals alike, whether visiting post-shopping or post-work. There will also be outdoor seating facing Camelback Mountain and a coffee shop for those on the go. Standard rooms and one- and two-bedroom suites will make up the accommodation offerings. There will be a bridal suite and five luxury entertainment suites on the 11th floor. For those visiting on business, five breakout room accommodating up to 40 people each will be available, plus an executive board room. The hotel will also cater to those hosting events. A 7,000-square-foot column-free ballroom with 34-foot sliding glass doors will open up to an adjacent lawn, suitable for outdoor events up to 600 people. The ballroom itself will be able to accommodate banquets up to 500 people and be divisible into four sections. The most notable part of the new Caesars Republic Scottsdale will be the 7th floor which will feature a rooftop pool and bar, the only rooftop pool in Scottsdale. It will be complete with views of Camelback Mountain and will be home to fun events like morning yoga and champagne. Guests will be able to find award-winning mixologist creations, weekend brunches, a private event space and a state-of-the-art fitness center.